I'm not the toy collector that I was in my younger days, but as a noted fan of the weirder bits of comics-related ephemera, I still keep an eye out for the strange stuff. 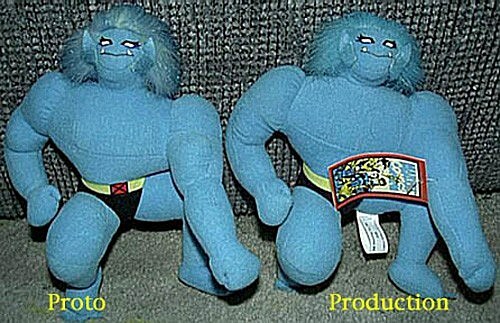 And last night, when a friend of mine sent me a link to ToyArchive.com's gallery of Japanese X-Men plush dolls from the '90s, which includes both the finished products and their prototypes, I was delighted. 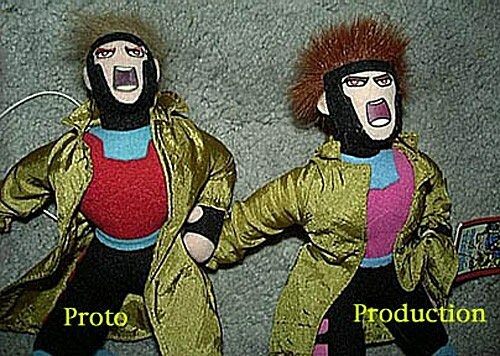 As ComicsAlliance Editor-in-Chief Laura Hudson pointed out when I sent her the pictures, these plush dolls look like they are at the world's angriest dance party. Take a closer look at the whole set, including a truly hilarious version of Rogue, after the jump! "Hey is it over there?" "No dude it's over there." 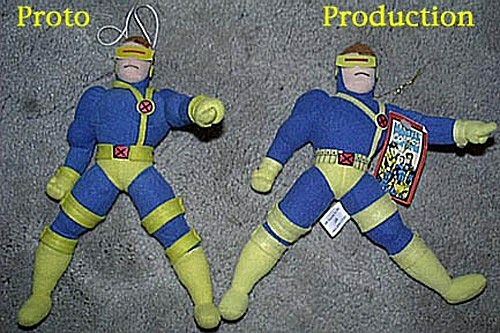 I have to say, as much as the final version more accurately captures the number of pouches Cyclops was rocking in the '90s, I much prefer the original version, as it looks like he's about to do an incredible Freddie Mercury impression. 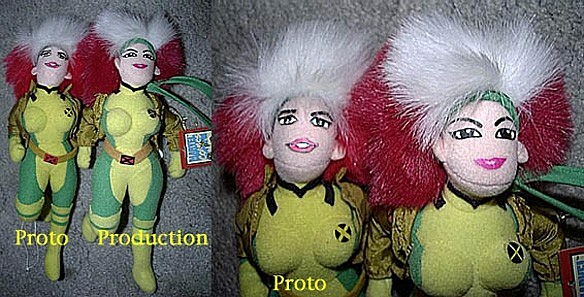 There's not a lot to say about this plush representation of the X-Men's resident scientist/garter aficionado other than that it's pretty darn adorable, but it bears mention that Japanese toy sideburn technology is light years ahead of ours. 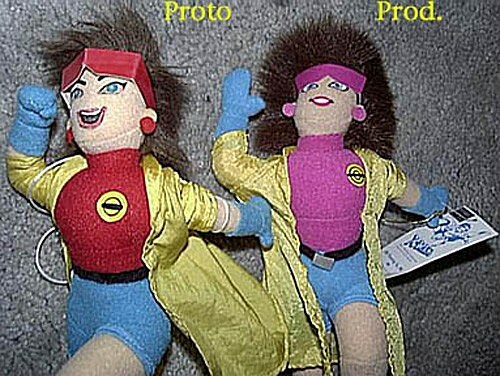 Jubilee (Left): Woo! Who is ready to party?! Jubilee (Right): DO YOU GUYS LIKE CANDY BARS? The final version of Gambit was color-corrected to his signature pink -- because why wouldn't a master thief wear pink and powder blue armor? -- but thankfully, they kept his amazing face. I'm not sure I've ever seen Gambit shout quite like that, but it's a pretty accurate representation of me whenever I have to read his ridiculous accent in my comics. 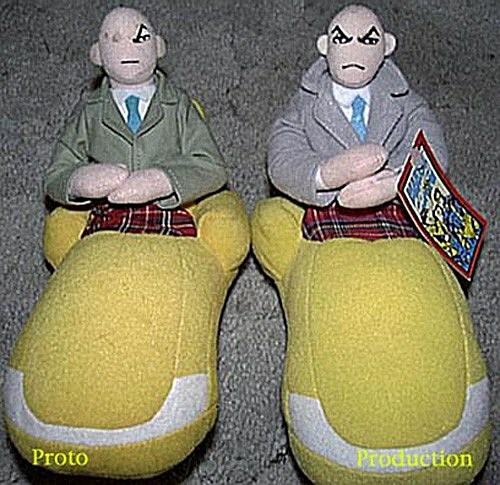 There aren't a whole lot of Professor X toys floating (and/or wheeling) around out there, but this one is fantastic. The frowny egg of a face he has is one thing, but the fact that the production version is actually posed so that he's constantly doing a sarcastic slow clap? That is gold. Finally, we have the most ridiculous of the lot, a Rogue that features an extremely prominent set of Southern charms. Also, I genuinely wonder why the clown 'fro was never used as her look in the comics. It seems to work pretty well for her.